Would you be able to tell if the wild Alaskan sockeye salmon you ordered for dinner was swapped out for a less expensive piece of farm-raised salmon? But what if you ordered the most coveted of salmon species — king salmon? (It&apos;s also known as Chinook.) Much like farmed Atlantic salmon, it&apos;s light in color, thick in texture and similarly marbled with fat. It&apos;s also significantly more expensive. And according to a new report released Wednesday by conservation group Oceana, it&apos;s a fish where you&apos;re more likely to get duped — especially if you order it from a restaurant during the winter. In its latest attempt to uncover seafood fraud, Oceana collected and tested 82 salmon samples from restaurants and grocery stores in Virginia, Washington, D.C., Chicago and New York between December 2013 and March 2014. Results showed that 43 percent of salmon samples tested were mislabeled, and that far more of that mislabeling is occurring in restaurants than in large supermarkets. The instances of salmon fraud were significantly higher than during an earlier 2013 nationwide study by the same group. That study included far more — 384 samples, which showed salmon fraud at only 7 percent. But the jump isn&apos;t being attributed to a sudden increase in unabandoned label swapping, rampant menu hijinks or differences in sample size. This survey was designed to measure fraud during the winter months, when salmon was not in season, and the marketplace would be shorter on supply, says Kimberly Warner, a senior scientist at Oceana who authored the new report. "In D.C. in summer, I don&apos;t think we had any salmon mislabeling. Same for Chicago," Warner tells The Salt. 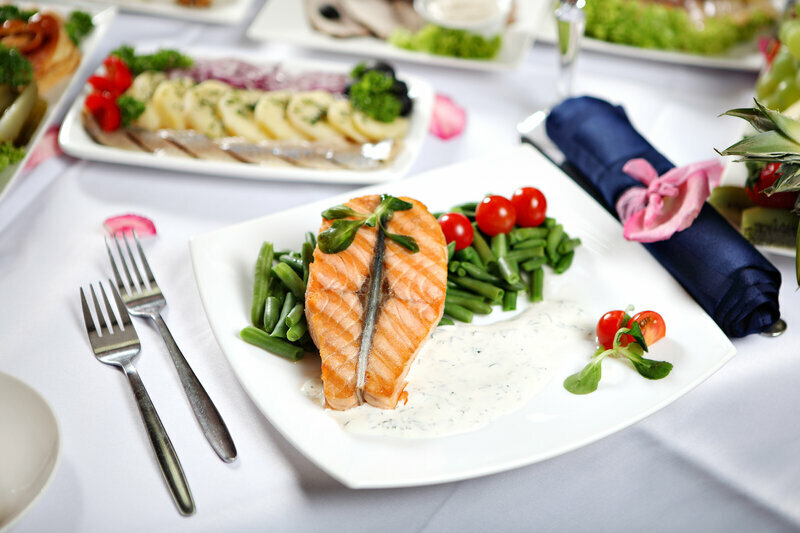 To select samples for the newest study, Oceana searched online menus for restaurants touting "wild salmon" and sought out salmon labeled "wild" in grocery stores. What the group found was that when wild salmon was out of season, the testing netted significantly different results. Diners were likely to get duped 67 percent of the time when ordering salmon in restaurants, compared with 20 percent of the time when buying in large grocery stores — which have to comply with country of origin labeling (COOL) regulations. And when diners were deceived, it was more likely to be an incident of farmed salmon being passed off as more expensive wild (69 percent of the time). Erica Cline, an associate professor at the University of Washington Tacoma, conducted a similar study published in 2012. Initially, she also found higher rates of farmed salmon being swapped for wild during winter months. But her ongoing testing in the years since has found that fraud tends to fluctuate regardless of season. Like Oceana&apos;s report, "we still see substantially higher rates of substitution in restaurants than in [grocery] stores," Cline says. Oceana says this kind of fraud is a real economic problem: Salmon-loving consumers aren&apos;t always getting what they&apos;re paying for, and responsible American salmon fishermen are being forced to compete with fraudulent products "receiving less cash than they should be for their hard-won catch," according to the report. And Warner says it&apos;s an environmental problem for those consumers who go the extra mile to consult seafood sustainability ratings like the Monterey Bay Aquarium&apos;s Seafood Watch, which ranks seafood as "best choice," "good alternative" or "avoid." "If someone is trying to purchase something rated as a "best choice," like a wild Alaskan salmon, and is getting in its place something from a foreign country that has problems with sea lice or antibiotic use — if farmed — or was caught illegally, it could have serious ecological consequences," says Warner. "Serious ecological consequences" is strong language. 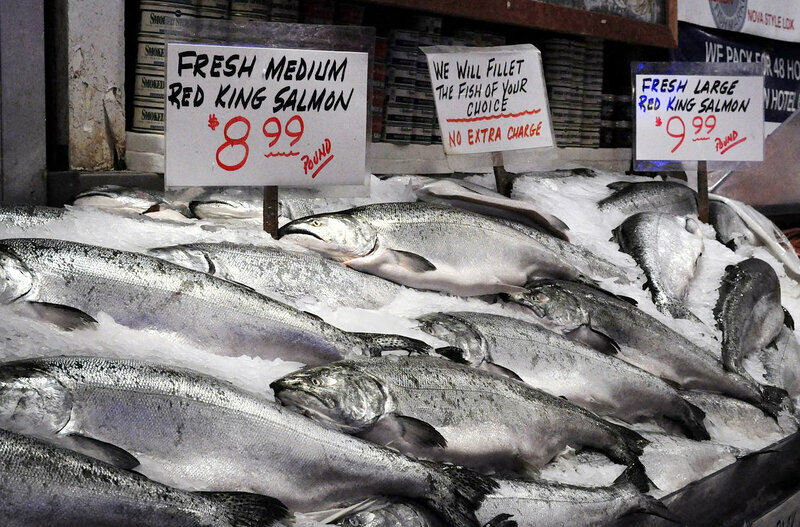 If the marketplace swap is simply farmed salmon for wild, rather than a species threatened by overfishing, the damage to the environment may be less than the damage to a deceived diner&apos;s wallet. Afterall, the farmed salmon industry has come a long way from it&apos;s days as a poster child for bad aquaculture practices, says NOAA Fisheries spokesperson Jennie Lyons. "There are a lot of misconceptions about aquaculture, and farmed salmon," Lyons tells The Salt. Salmon is the most popular fish in America. We consume impressive amounts of it — nearly 870 million pounds of a year. The majority of that, nearly two-thirds, come from farmed salmon, grown outside the U.S, despite the fact that American fishermen catch enough salmon to satisfy 80 percent of our domestic demand. But global seafood supply chains are complex. Fish don&apos;t often travel in a straight line from fishermen to chef to plate. Approximately 70 percent of U.S. wild-caught salmon is exported, much of it to Asia for processing into tidy fillets. And at each step in that journey, information about the fish — where it was caught, how it was caught and the exact species — can get left behind. That&apos;s true even when the same salmon sent to China for processing is refrozen and shipped back to us — a head-scratching fish swap noted by author Paul Greenberg in American Catch. Precisely how much of that salmon comes back to quell American appetites is unclear. "No one has yet given me a satisfying answer for how much of that is reimported," says Greenberg. Warner says that&apos;s because no one is tracking it. This system creates conditions ripe for fraud and mislabeling. There are no traceability requirements in place that will follow a fish from the point where it was caught to its final place on your dinner plate. "We have no tracking of our fish through the supply chain. That&apos;s how something like illegal caught Russian salmon can enter into our supply chain," she says — and be mislabeled as "pacific salmon" or "wild salmon." And it is why Oceana is calling on the President&apos;s Task Force on Combating Illegal, Unreported and Unregulated Fishing and Seafood Fraud to include salmon asaspecies at high risk for fraud, and to expand documentation requirements to all seafood entering the U.S. supply chain. Steven Wilson, deputy director of the Office of International Affairs and Seafood Inspection at NOAA Fisheries, is a member of the task force. He, says issues of seafood fraud are on the government&apos;s radar, but says NOAA&apos;s own testing has not shown an uptick in salmon species substitutions. "We&apos;re seeing an increase of seafood fraud as you move further down the supply chain, but we&apos;re not seeing an increase in the overall percentage being mislabeled," says Wilson. The further down the supply chain a fish goes, the likelier it is to be mislabeled he says — but he stresses that not all menu mislabeling is intentional. "Someone can make a simple mistake," Wilson says. "They serve salmon on the menu, run out, buy more and wouldn&apos;t necessarily even think about it. It&apos;s very telling that salmon fraud identified in grocery stores was far less. Restaurants are the most susceptible." His advice on avoiding salmon fraud echoes Oceana&apos;s: Ask questions — and lots of them. Look at the price you&apos;re paying for the salmon: If it&apos;s too good to be true, be cautious. Warner would add: Seek-out wild salmon in-season, and look for fish that are traceable back to the boat. Wilson says it&apos;s important to keep the problem in perspective. "Is the consumer being defrauded? If the consumer definitely wants wild caught, they&apos;re not getting what they&apos;re paying for," he says. "But what if they&apos;re paying less? If they&apos;re paying for Atlantic salmon, they&apos;re getting what they&apos;re paying for. What if they&apos;re paying for ambiance, a night out with good friends? [Then] they&apos;re getting what they&apos;re paying for. It&apos;s fuzzy. I&apos;m not condoning it, but how far do we go, and what&apos;s the punishment?"